With summer just around the corner, we are all spending more time outdoors. It's times like this that we become even more conscious of the need to take care of our earth. Whether you consider yourself an energy-saving pro or are just beginning to look for ways to improve your environmental sensibilities, we can help by offering some of the most sustainable and earth-friendly products available in the industry. 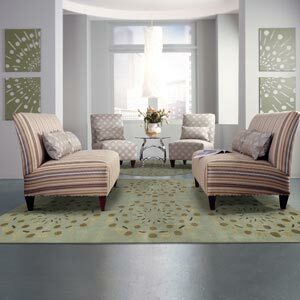 Looking for environmentally conscious carpets or area rugs? Look no further! Kermans carries the Karastan line of carpets and area rugs. As a manufacturer Karastan is committed to the environment from their choice of materials thru the manufacturing process and beyond. also friendly to the environment. Choose woven over tufted. Woven carpets and rugs last twice as long as those that are tufted. Increasing longevity by 200% reduces energy consumption by 50% and keeps woven products out of landfills 14 to 21 years beyond conventional floor coverings. Look for wool. Wool is a sustainable and biodegradable fiber that is naturally hardwearing and beautiful. By nature, wool is known to be dirt and soil resistant, fire retardant, and non-allergenic. Let your rug help you clean the air. Karastan Wools also have the ability to absorb indoor air contaminants, contributing to a healthier and more comfortable home. Go green. All Karastan carpets are CRI Green Label Plus (GLP) and contribute to LEED points. Use renewable resources. 37% of SmartStrand® with DuPont™ Sorona® renewably sourced polymer is produced with readily available agricultural materials that include corn sugars. Purchase your Karastan area rug or carpet before the end of May and receive Up to $1,000 cash back on qualifying purchases. Drive - or ride your bike - to our Indianapolis showroom to touch, feel and see these excellent and environmentally conscious flooring choices. Kermans is located just inside 465 and easy to reach from Zionsville, Carmel, Noblesville, Fishers, Greenwood and all Indianapolis-area locations.